Oh that is going to look sweet on you! Have fun at the wedding! Lovely! I just picked up Vogue 6680 this weekend and it's shocking how similar the two patterns are. 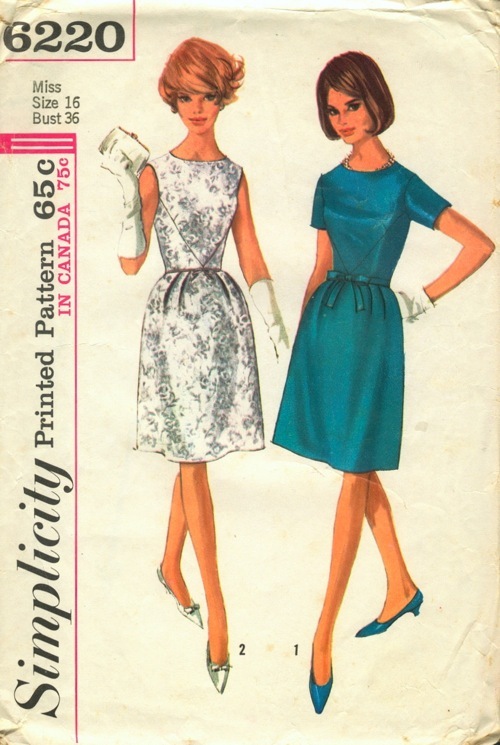 Seriously, even the pattern envelope styling has a white lace dress on the left and a dark teal on the right. Only the sleeve options seem to differ. Crazy coincidence, and now I'm really excited to try out the pattern. Oh wow, those are super similar!! The only big differences in design I see are the "slightly stand-up neckline" (i love the pattern description) and the difference in the pleats on the front skirt. I'm very curious to see how the construction differs--looks like the vogue version might be fully underlined and the belt is built in? Simplicity really did make it more simple, I guess! Oooh pretty. I find it hard not to get seduced by what I see on the envelope. In all I think picking the appropriate fabric for the pattern is one of the most challenging things about sewing! Bravo, this works perfectly. I feel the same--it can be hard to find pretty, unique fabrics that really speak to you. I usually end up just going for solids. What I'd give for a reliable source of pretty florals! Such a pretty dress! I have this pattern too and made a cotton version last year, I found the sleeves difficult to ease in as well which was a bit annoying. I think the sleeves could be better--they wouldn't ease in 100% correctly which was part pattern and part fabric, I think, but then even with all that ease I felt like my range of motion was only okay! oh its so pretty! i remindes me of the dress i wore to my year 6 farewell (end of primary school dance) where i wanted to look like Baby Spice so i had my mum make me a light blue voile dress. ahhh memories! it looks really fab! and the underlining is a good idea!